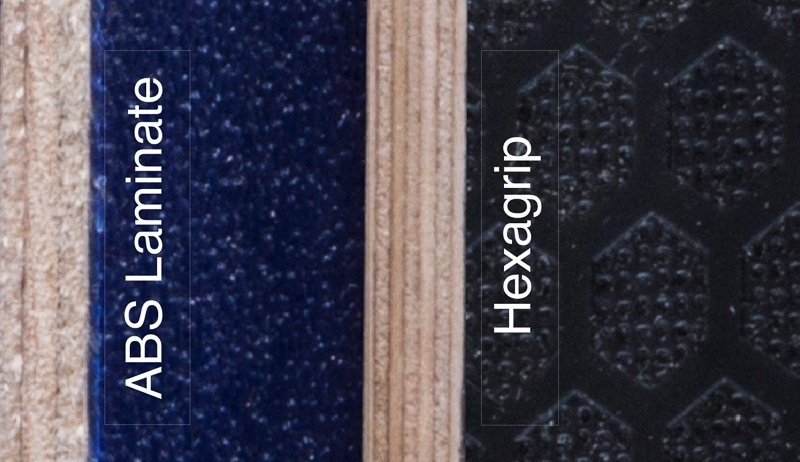 Hexagrip is a precision, mulitlayer plywood panel coated with a black phenolic film on both sides; one side is textured with a hexagonal pattern that is slip and scuff resistant. The precision plywood base comprises multiple thin layers of high quality birch veneers bonded together resulting in a stiff/rigid and true board, but one that is not brittle. The tolerance on a typical 9 layer (3/8”) board (pictured above) is less than 3 hundreths of an inch. Besides the highest quality plywood base, the textured and smooth phenolic coating is attractive, resistant to impact, scratches, marring, grease and fingerprints, and since it is chemically bonded to to substrate, it is resistant to heat and sun and will not bubble or delaminate. ABS laminate panels consist of a single-sided plastic sheet glued/laminated to varied quality and ply ACX softwood plywood or solid-core hardwood (luann or meranti) substrate. Unlike the phenolic coating of Hexagrip, the bond of the plastic coating on ABS laminate varies in quality based on the manufacturing process of the composite panel. ABS panels are only as good as the quality of the plywood, glue bond, and your ability to keep them out of the sun. Frequently, case manufacturers will stock several different qualities of ABS laminate in varying thicknesses, based on their price point, and availability. 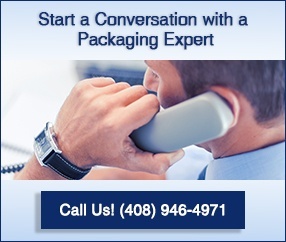 Case panel materials is just one aspect of a custom case that affects the quality and longevity of a packaging solution. Aside from quality parts, a superior packaging solution must also include a great design, quality craftsmanship, fast fulfillment, and outstanding service. LPC is located in the heart of Silicon Valley and provides outstanding service throughout the bay area for ATA cases for industries such as semiconductor, medical, cloud, and high-tech. ATA cases are also known as flight cases, transit cases, and road cases.